Have you ever given a thought about just how much we put things off instead of living our lives to the full? I was like that for years on end, I always tried to brainwash myself that there are a thousand other things more urgent today than living my life. 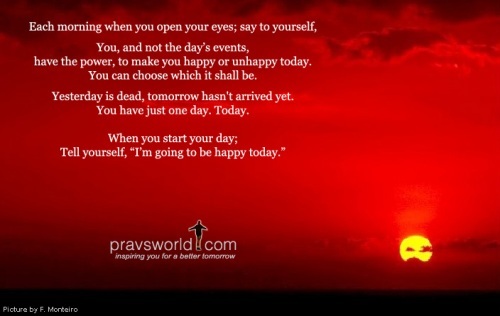 And I assured myself that I would start living completely…..tomorrow! And I waited ……and waited…..and waited and guess what……it never came! While I was busy making other plans and anguish about nonsense, life kept waiting. While I’m busy killing the daily fires, tomorrow kept dissapearing away from me. Always more to do, more responsibilities, more ultimatums. I always thought, “when I have more money, I’ll be happy”,….”when I can go on holiday, I’ll find my zone”, when, when when!! Tomorrow I might be less agitated, tomorrow the weather will just be fine!! In my contemplation for tomorrow to come, today became a big, big dissatisfaction. So finally I came to the conclusion that I can live my life TODAY!! Maybe I can smile at someone who needs it, maybe I can call someone that I have not spoken to in a while, maybe I can buy myself those flowers I so love, maybe I can go for a walk on the beach! Send an “I love you” sms to someone, forgive a person you had bad feelings about….do it TODAY!! Do whatever, as long as you do it TODAY….live your life today….who knows for how long it will last. Life is precious. This entry was posted on April 9, 2010 at 7:51 am and is filed under Uncategorized. You can follow any responses to this entry through the RSS 2.0 feed. You can leave a response, or trackback from your own site.